Brentford brushed aside Sheffield Wednesday, who were pushed closer to the League One relegation zone. Michael Spillane gave the visitors an early lead, heading home Nathan Byrne's corner, before Rob Jones nodded the Owls level from close range. The Bees regained the advantage when Lewis Grabban skipped past Jones and fed Jeffrey Schlupp, who headed in. Sammy Saunders sealed Brentford the points with a superb 25-yard free-kick past home keeper Richard O'Donnell. "It's obviously a poor performance, both with the ball and without it and we can't make any excuses. "There's no point in dwelling on the negatives because there were certainly a great deal of those. "We didn't have an outlet, either down the sides or into feet and we've committed suicide in the first few minutes as it was a really sloppy goal." 90:00+3:28 The game is over, as the referee blows his whistle. 90:00+2:56 Shot by Owain Tudur Jones. Lewis Buxton gets a block in. 90:00+2:03 Joey O'Brien has shot on goal from just outside the penalty box which goes wide of the right-hand upright. 90:00+1:11 Marcus Bean challenges Gary Madine unfairly and gives away a free kick. Lewis Buxton takes the free kick. 90:00+0:08 Isaiah Osbourne has an effort at goal from outside the area missing to the wide left of the goal. 87:55 Owain Tudur Jones takes a shot. Blocked by Lewis Buxton. Corner taken short by Nathan Byrne. 87:15 The ball is crossed by Jon Otsemobor, Trevor Carson makes a save. 84:03 Foul by Isaiah Osbourne on Nathan Byrne, free kick awarded. Michael Spillane restarts play with the free kick. 84:03 Booking Isaiah Osbourne booked. 81:03 GOAL - Sam Saunders:Sheff Wed 1 - 3 Brentford Sam Saunders hits the back of the net with a direct shot from the free kick. 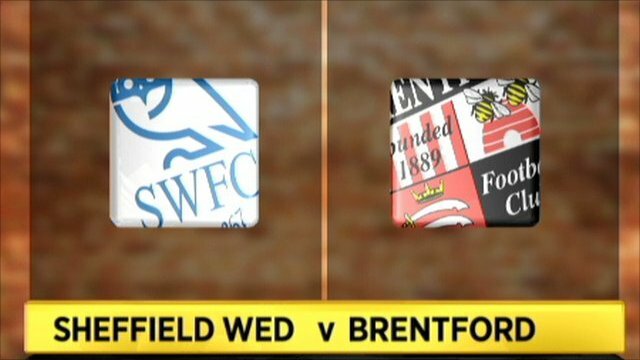 Sheff Wed 1-3 Brentford. 80:09 Danny Batth gives away a free kick for an unfair challenge on Nathan Byrne. 78:18 Pim Balkestein gives away a free kick for an unfair challenge on Gary Madine. Gary Madine crosses the ball, Effort on goal by Jermaine Johnson from deep inside the penalty area misses to the right of the target. 76:35 Isaiah Osbourne concedes a free kick for a foul on Sam Saunders. Free kick taken by Trevor Carson. 74:14 The ball is crossed by Jermaine Johnson. 70:51 Gary Madine has an effort at goal from outside the box which goes wide right of the goal. 69:38 Jermaine Johnson takes a shot. Blocked by Karleigh Osborne. 68:13 Jermaine Johnson has an effort at goal from outside the area missing to the wide right of the target. 68:13 Substitution Kevin O'Connor goes off and Owain Tudur Jones comes on. 67:28 Pim Balkestein challenges Clinton Morrison unfairly and gives away a free kick. Tommy Spurr takes the direct free kick. 67:11 Lewis Grabban produces a right-footed shot from just outside the penalty area that goes harmlessly over the target. 65:24 The ball is swung over by Nathan Byrne, Tommy Spurr gets a block in. Outswinging corner taken from the right by-line by Nathan Byrne. Correction - 64:19 The offside flag is raised against Clinton Morrison. Free kick taken by Trevor Carson. 64:19 The assistant referee flags for offside against Clinton Morrison. Trevor Carson takes the free kick. 63:02 Marcus Bean fouled by Gary Teale, the ref awards a free kick. Craig Woodman takes the free kick. 62:26 Substitution Sam Wood goes off and Sam Saunders comes on. 62:10 Centre by Jermaine Johnson, save made by Trevor Carson. 61:40 Tommy Spurr sends in a cross, blocked by Lewis Grabban. Corner taken by Tommy Spurr from the right by-line, save by Trevor Carson. 61:12 Corner taken left-footed by Tommy Spurr to the near post, clearance made by Karleigh Osborne. 60:43 Free kick awarded for an unfair challenge on Gary Teale by Michael Spillane. Direct free kick taken by Tommy Spurr. 59:36 Foul by Danny Batth on Nicholas Bignall, free kick awarded. Michael Spillane fires a strike on goal direct from the free kick. 57:25 Lewis Buxton fouled by Nicholas Bignall, the ref awards a free kick. Tommy Spurr restarts play with the free kick. 55:58 Free kick awarded for an unfair challenge on Kevin O'Connor by Isaiah Osbourne. Direct free kick taken by Marcus Bean. 55:58 Substitution Darren Potter goes off and Jermaine Johnson comes on. 55:58 Substitution Clinton Morrison comes on in place of Paul Heffernan. 52:16 Effort on goal by Isaiah Osbourne from just outside the area goes harmlessly over the target. 51:36 Nicholas Bignall gives away a free kick for an unfair challenge on Joey O'Brien. Direct free kick taken by Lewis Buxton. 49:21 Shot from outside the box by Gary Madine misses to the left of the target. 47:57 Overhead kick right-footed shot by Gary Teale. Clearance made by Craig Woodman. 45:52 Lewis Grabban takes a shot. Save by Richard O'Donnell. 45:01 Substitution Nicholas Bignall on for Jeffery Schlupp. 45:00+2:11 The ref blows to signal half-time. 45:00+2:00 The ball is sent over by Tommy Spurr, Pim Balkestein manages to make a clearance. 43:16 Free kick awarded for an unfair challenge on Jeffery Schlupp by Joey O'Brien. Craig Woodman crosses the ball in from the free kick. Lewis Grabban is flagged offside by the assistant referee. Richard O'Donnell restarts play with the free kick. 40:29 Nathan Byrne concedes a free kick for a foul on Gary Teale. Free kick taken by Isaiah Osbourne. 37:49 Free kick awarded for a foul by Isaiah Osbourne on Marcus Bean. Craig Woodman restarts play with the free kick. 33:42 Pim Balkestein is penalised for handball and concedes a free kick. Darren Potter fires a strike on goal direct from the free kick. 33:17 Michael Spillane gives away a free kick for an unfair challenge on Gary Madine. Direct free kick taken by Tommy Spurr. 31:30 Tommy Spurr crosses the ball, blocked by Michael Spillane. 28:36 Unfair challenge on Craig Woodman by Darren Potter results in a free kick. Craig Woodman takes the free kick. 27:18 Isaiah Osbourne concedes a free kick for a foul on Jeffery Schlupp. Trevor Carson takes the direct free kick. 24:45 Free kick awarded for an unfair challenge on Nathan Byrne by Tommy Spurr. Michael Spillane restarts play with the free kick. 24:45 Substitution (Sheff Wed) makes a substitution, with Jon Otsemobor coming on for Rob Jones. 19:17 Inswinging corner taken right-footed by Karleigh Osborne. 17:33 Assist on the goal came from Lewis Grabban. 17:33 GOAL - Jeffery Schlupp:Sheff Wed 1 - 2 Brentford Jeffery Schlupp finds the back of the net with a headed goal from inside the six-yard box. Sheff Wed 1-2 Brentford. 13:12 Gary Teale gives away a free kick for an unfair challenge on Michael Spillane. Free kick crossed by Sam Wood, clearance by Joey O'Brien. 11:34 Corner taken right-footed by Gary Teale from the left by-line to the near post, Gary Teale provided the assist for the goal. 11:34 GOAL - Rob Jones:Sheff Wed 1 - 1 Brentford Rob Jones fires in a goal from close range high into the middle of the goal. Sheff Wed 1-1 Brentford. 10:09 Handball decision goes against Craig Woodman. The free kick is delivered left-footed by Tommy Spurr from right by-line, Michael Spillane makes a clearance. 9:28 The ball is sent over by Isaiah Osbourne, Gary Madine produces a header from deep inside the six-yard box that clears the bar. 8:50 Unfair challenge on Gary Madine by Karleigh Osborne results in a free kick. The free kick is delivered left-footed by Tommy Spurr from left channel. 7:14 Michael Spillane is penalised for a handball. Richard O'Donnell restarts play with the free kick. 5:52 Tommy Spurr delivers the ball, clearance made by Karleigh Osborne. 2:54 Corner taken right-footed by Nathan Byrne from the right by-line, the assist for the goal came from Nathan Byrne. 2:54 GOAL - Michael Spillane:Sheff Wed 0 - 1 Brentford Michael Spillane finds the net with a goal from inside the six-yard box high into the middle of the goal. Sheff Wed 0-1 Brentford. 1:02 Free kick awarded for an unfair challenge on Marcus Bean by Isaiah Osbourne. Direct free kick taken by Michael Spillane. 0:16 Free kick awarded for a foul by Rob Jones on Jeffery Schlupp. Pim Balkestein takes the free kick.